Mocht u de artikelen op kanker-actueel.nl waarderen dan wilt u misschien donateur worden? En als donateur kunt u naast toegang tot bepaalde artikelen alleen voor donateurs ook korting krijgen bij verschillende bedrijven. bevestigt de uitstekende resultaten van elotuzumab, een vorm van immuuntherapie, bij vergevorderde Multiple Myeloma (ziekte van Kahler). Een verbetering van mediaan ca. 30 procent betere overall overleving in vergelijking met alleen lenalidomide plus dexamethason blijkt duurzame verbetering, want ook na 4 jaar follow-up van de studie werden deze resultaten gezien. Zie verder hieronder. En nieuw abstract onderaan artikel. Wanneer patiënten met gevorderde Multiple Myeloma (ziekte van Kahler) of een recidief na minimaal 1 chemokuur het immuuntherapeutische middel elotumumab (Empliciti) aanvullend krijgen toegediend op een behandeling met lenalidomide en dexamethason dan verbeteren de resultaten op progressievrije ziekte en overall overleving met mediaan 30% in vergelijking met alleen lenalidomide plus dexamethason. Zo blijkt uit een gerandomiseerde fase III studie - de ELOQUENT-2 studie - bij totaal 636 patiënten met gevorderde Multiple Myeloma - Kahler of met een recidief na minimaal 1 chemokuur. De EMU - Europese Medische Autoriteit wil elotumumab nu de officiële status van geregistreerd medicijn geven. De FDA gaf deze status aan elotumumab al vorig jaar na de eerste publicaties uit de ELOQUENT-2 studie. Elotumumab werkt als een immuuntherapeutisch middel, vergelijkbaar met bv. hoe nivolumab werkt, en is vooral gericht op het eiwit SLAMF7 dat veel voorkomt op tumorcellen èn op natural killercellen. In de studie werden gerandomiseerd 321 patiënten in de elotuzumab groep ingedeeld en 325 patiënten in de controlegroep. Na een mediane follow-up van 24,5 maanden was na 1 jaar nog 68% vrij van progressie van de ziekte in de elotuzumab groep vergeleken met 57% in de controle groep. Na 2 jaar waren die cijfers nog beter: 41% versus 27%, respectievelijk. Mediane progressie-vrije overleving in de elotuzumab groep was 19.4 maanden versus 14.9 maanden in de controle groep (hazard ratio voor progressie of sterven in de elotuzumab groep, 0.70; 95% confidence interval, 0.57 to 0.85; P<0.001). De overall respons in de elotuzumab groep was 79%, versus 66% in de controle groep (P<0.001). Algemeen voorkomende graad 3 en 4 bijwerkingen in beide groepen waren lymphocytopenia, neutropenia, vermoeidheid en pneumonia. Infusie reacties deden zich voor bij 33 patiënten (10%) in de elotuzumab groep en beperkten zich tot graad 1 en 2 bij 29 patiënten. Patiënten met een recidief van of resistentie van gevorderde Multiple Myeloma - Kahler die een combinatiebehandeling kregen van elotuzumab, lenalidomide en dexamethasone hadden een statistisch significante vermindering van de kans op progressie van de ziekte of te sterven aan de ziekte. Het studieprotocol van de ELOQUENT-2 studie kunt u vinden onder ClinicalTrials.gov number, NCT01239797. Het volledige studierapport: Elotuzumab Therapy for Relapsed or Refractory Multiple Myeloma is tegen betaling in te zien of te downloaden. Patients with relapsed or refractory multiple myeloma who received a combination of elotuzumab, lenalidomide, and dexamethasone had a significant relative reduction of 30% in the risk of disease progression or death. Elotuzumab, an immunostimulatory monoclonal antibody targeting signaling lymphocytic activation molecule F7 (SLAMF7), showed activity in combination with lenalidomide and dexamethasone in a phase 1b–2 study in patients with relapsed or refractory multiple myeloma. In this phase 3 study, we randomly assigned patients to receive either elotuzumab plus lenalidomide and dexamethasone (elotuzumab group) or lenalidomide and dexamethasone alone (control group). Coprimary end points were progression-free survival and the overall response rate. Final results for the coprimary end points are reported on the basis of a planned interim analysis of progression-free survival. 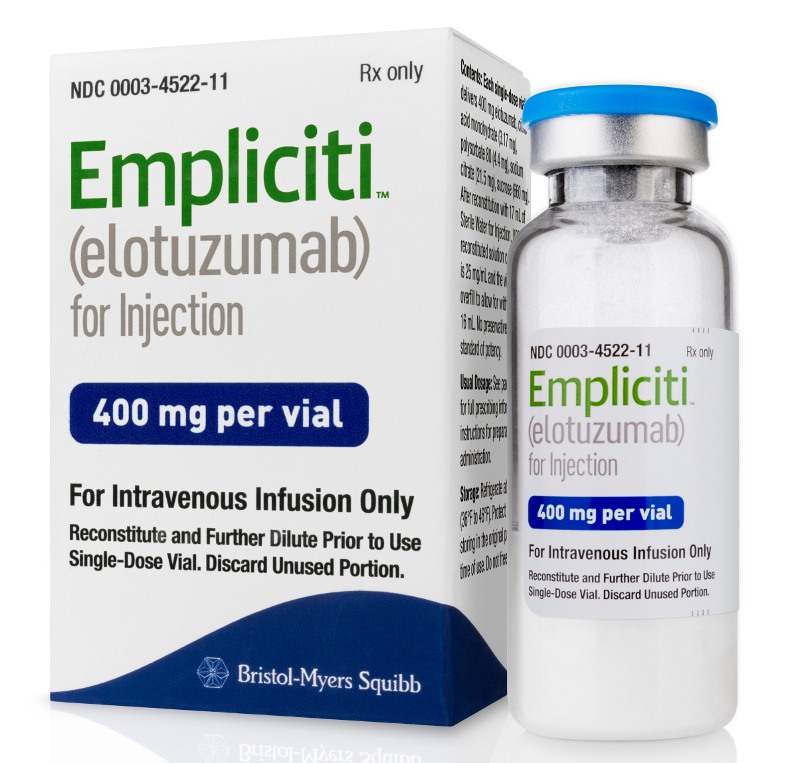 Overall, 321 patients were assigned to the elotuzumab group and 325 to the control group. After a median follow-up of 24.5 months, the rate of progression-free survival at 1 year in the elotuzumab group was 68%, as compared with 57% in the control group; at 2 years, the rates were 41% and 27%, respectively. Median progression-free survival in the elotuzumab group was 19.4 months, versus 14.9 months in the control group (hazard ratio for progression or death in the elotuzumab group, 0.70; 95% confidence interval, 0.57 to 0.85; P<0.001). The overall response rate in the elotuzumab group was 79%, versus 66% in the control group (P<0.001). Common grade 3 or 4 adverse events in the two groups were lymphocytopenia, neutropenia, fatigue, and pneumonia. Infusion reactions occurred in 33 patients (10%) in the elotuzumab group and were grade 1 or 2 in 29 patients. Supported by Bristol-Myers Squibb and AbbVie Biotherapeutics. Drs. Lonial and Dimopoulos contributed equally to this article. This article was published on June 2, 2015, at NEJM.org. We thank the study protocol manager, Katherine Nunnick, for her support and Alyson Bexfield and Joanne Tang of Caudex for their assistance in the preparation of the manuscript. From Winship Cancer Institute, Emory University School of Medicine, Atlanta (S.L. ); National and Kapodistrian University of Athens, Athens (M.D. ); A.O.U. San Giovanni Battista di Torino–Ospedale Molinette, Turin, Italy (A.P. ); QEII Health Science Center and Dalhousie University, Halifax, NS (D.W.), Cross Cancer Institute and University of Alberta, Edmonton (A.B. ), and Princess Margaret Cancer Centre, Toronto (D.R.) — all in Canada; Silesian Medical University, Katowice (S.G.), and Medical University of Lublin, Lublin (A.W.-C.) — both in Poland; Charles University Hospital, Prague, Czech Republic (I.S. ); University Hospital, Nantes, France (P.M.); Complejo Asistencial Universitario de Salamanca–Instituto de Investigación Biomédica de Salamanca, Salamanca (M.-V.M. ), and Clinica Universidad de Navarra–Centro de Investigación Médica Aplicada, Instituto de Investigación Sanitaria de Navarra, Pamplona (J.S.-M.) — both in Spain; Davidoff Cancer Center, Rabin Medical Center, Petah Tikva, and Tel Aviv University, Ramat Aviv — both in Israel (H.M.); Ankara University, Ankara, Turkey (M.B. ); Alfred Health–Monash University, Melbourne, VIC, Australia (A. Spencer); Barts and the London NHS Trust, London (H.O. ); University of Texas M.D. Anderson Cancer Center, Houston (R.Z.O. ); Kyoto Prefectural University of Medicine, Kyoto (M.T. ), and Nishigunma National Hospital, Shibukawa (M.M.) — both in Japan; Universitätsklinikum der Technische Universität, Dresden (C.R. ), and Universitätsklinikum Würzburg, Würzburg (H.E.) — both in Germany; Zeikenhuis Netwerk Antwerpen (ZNA) Stuivenberg, Antwerp, Belgium (K.L.W. ); AbbVie Biotherapeutics, Redwood City, CA (A. Singhal); Bristol-Myers Squibb, Princeton, NJ (J.K.), Wallingford, CT (E.B. ), and Braine-l’Alleud, Belgium (V.P. ); and Dana–Farber Cancer Institute, Boston (K.C.A., P.R.). Address reprint requests to Dr. Lonial at the Department of Hematology and Medical Oncology, Winship Cancer Institute, Emory University School of Medicine, 1365 Clifton Rd., Bldg. C, Atlanta, GA 30322, or at sloni01@emory.edu. We thank all co‐investigators and the patients and families who participated in the ELOQUENT‐2 trial. Professional medical writing assistance was provided by Simon Wigfield, PhD, and Cristina Tomas, PhD, of Caudex, and was funded by Bristol‐Myers Squibb. The last 2 authors are co‐senior authors. The randomized phase 3 ELOQUENT‐2 study (NCT01239797) evaluated the efficacy and safety of elotuzumab plus lenalidomide and dexamethasone (ELd) versus lenalidomide and dexamethasone (Ld) in relapsed/refractory multiple myeloma (RRMM), and to date, has the longest follow‐up of any monoclonal antibody in patients with RRMM. In this extended 4‐year follow‐up of the ELOQUENT‐2 trial, the coprimary endpoints of progression‐free survival (PFS) and overall response rate as well as the secondary endpoint of overall survival were assessed. In the absence of head‐to‐head trials comparing Ld‐based triplet regimens to guide treatment selection, 4 randomized controlled trials—ELOQUENT‐2, ASPIRE, TOURMALINE‐MM1, and POLLUX—were indirectly compared to provide insight into the relative efficacy of these regimens in RRMM. Data at 4 years were consistent with 2‐ and 3‐year follow‐up data: ELd reduced the risk of disease progression/death by 29% versus Ld (hazard ratio, 0.71) while maintaining safety. The greatest PFS benefit among the assessed subgroups was observed in patients at the median time or further from diagnosis (≥3.5 years) with 1 prior line of therapy, who had a 44% reduction in the risk of progression/death, and in patients in the high‐risk category, who had a 36% reduction in favor of ELd. This regimen also showed a relative PFS benefit that was maintained beyond 50 months. The sustained PFS benefit and long‐term safety of ELd at 4 years, similar to those observed at 2 and 3 years, support ELd as a valuable therapeutic option for the long‐term treatment of patients with RRMM. Reageer op "Elotuzumab - een immuuntherapeutisch middel - aanvullend op lenalidomide en dexamethason geeft 30% betere overall overleving en progressievrije ziekte dan alleen lenalidomide en dexamethason bij gevorderde Multiple Myeloma - Kahler"
Nederlandse studie geeft overzicht van overall overleving bij Multiple Myeloma (Kahler) in alle stadia in periode 2008 tot 2013. Hoewel overall overleving sterk verbetert met nieuwe medicijnen bij Multiple Myeloma / ziekte van Kahler blijven patienten met de del17p mutatie een veel slechtere prognose op overleving te hebben. Cryotherapie tijdens toediening van Melphalan bij Kahler zorgt voor hoog significante verbetering van minder optreden van mucositis en andere bijwerkingen behorend bij chemo en beenmergtransplantatie.